CBRE is pleased to offer for sale Wilson Farms, ± 124 acres of prime commercial development land located strategically between the thriving cities of Mount Juliet and Lebanon, directly off Interstate 40 in Wilson County, Tennessee with direct access to State Route 840, Highway 109, I-65, and I-24. Wilson Farms consists of ± 340 total acres led by the development of The Venue at 109, a luxury apartment community consisting of 728 units and an array of exceptional amenities including two resort-style swimming pool with an event center, 24/7 state of the art fitness center with a yoga studio, outdoor gas grilling stations, “Bark” park, playground area, walking trails, and many more. The Venue 109 is currently under construction and anticipates residents to begin moving in Q1 2019. 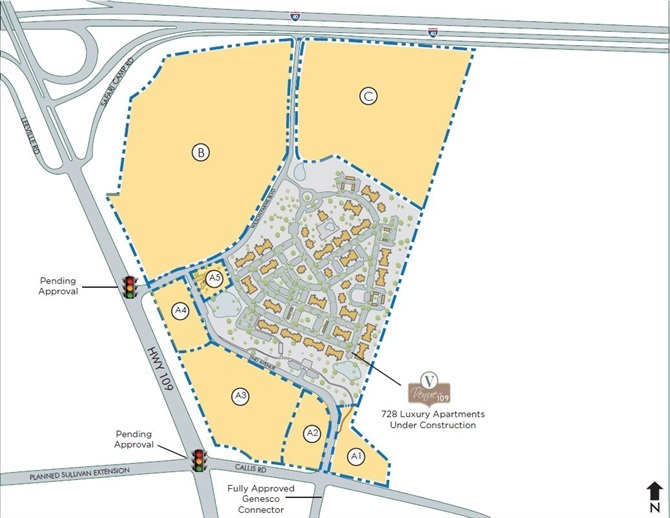 There are an additional ± 158 acres planned for future residential development that will further increase the population, along with The Venue at 109, within the Wilson Farms development. Not to mention that within five miles of Wilson Farms there are currently ± 5,593 residential homes planned by separate developers.